your unerasable text is an interactive installation, dealing with the topics of data collection, elimination and protection of our privacy. Visitors are asked to send a text message to the number written on a sign next to the installation. The receiving mobile phone transfers the data to a computer, which layouts the message automatically. It is then printed on to a DIN A6 paper, falling directly into a paper shredder. There, the message remains readable for a few moments and is then destroyed. 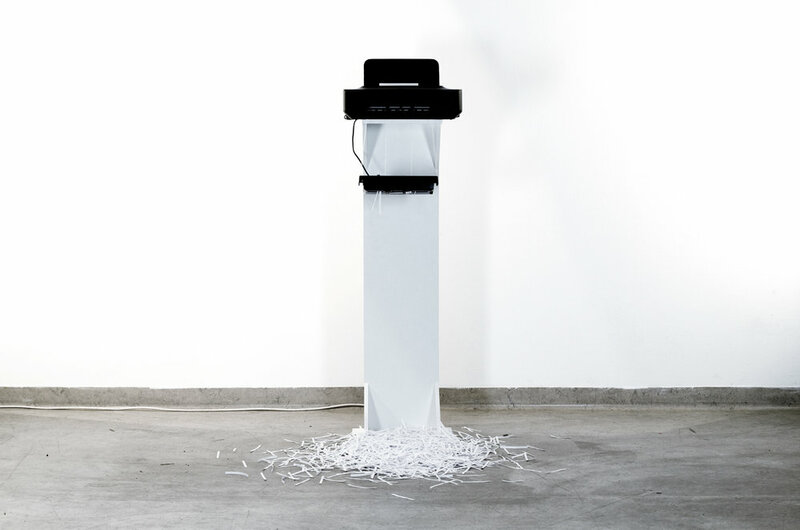 The shredded paper forms a visible pile of paper on the floor, growing with every message. The installation shows that your sent text message isn’t really erased. Your data is passing through the mobile carriers of the phones used, and to the computer processing the text and sending it to the printer. A file of each message, consisting of the sent text, the phone number of the sender and time and date when it was sent, is being stored. The only thing that actually is erased is the print-out, which is just visualization but having no effect on the data itself. Data collection and protection is at the center of this work, addressing controversial discussions in Austria and Germany about laws adopted some years ago impeding the right to privacy and data protection. In addition, recent news reports about data of 50 million Facebook user profiles being acquired illicitly by a data analytics and advertising company are reinforcing this trend.